Less than a year earlier on another trip down to Alabama I had participated in my sister’s wedding, where there were plenty of side conversations with relatives and friends at the reception in the small church hall about how Debra, emaciated by the ravages of colon cancer less than a decade earlier, was now a pretty, slightly plump bride. By the time I arrived in Alabama the second time, most of the relatives knew as I did: the cancer had returned. We didn’t learn any of this from Debra. “I’m doing fine,” she always said whenever we talked by phone and my probing questions about when she had seen the doctor last or what the doctor had said during a last visit got me anywhere. Our mother was still in her long recovery from brain surgery so my niece (Debra’s only child) was my only lifeline to the truth. My niece was with Debra when I arrived at the hospital in Tuscaloosa. Although I had been warned that Debra had lost a lot of weight, the sight of her lying in the hospital bed, her narrow face staring at me through metal rimmed glasses I had never seen her wear before, sent my body into immediate rebellion. I felt as though it was trying to forge some reaction from me, but not yet sure what it was, I didn’t know whether to fight or give in. The best I could do was manage a boyish grin, the same one I had probably brandished when I had surprised her by showing up at her wedding rehearsal eight months earlier. “Pull up a seat,” Debra said, sounding much more robust than she looked. She pointed at a metal chair shoved against the wall near the door to the small bathroom. I reached for the chair feeling her studying me in that way big sisters do and feeling the panic I felt years earlier when I first heard the news from my mother that Debra had colon cancer. I was surprised at how easily the chair lifted, like it was made of some newly discovered lightweight metal with titanium-mitered joints. Where was the science to help my sister? As we talked, I wanted to ask about her husband, a man she had known for years before she married him, but I had heard the relationship had been strained lately and I didn’t want to upset her. We talked until the nurse came in and began busying himself around the bed. On the walk outside to the elevator, my niece and I talked about how hard it was to accept Debra’s decision to take a break from chemotherapy. Debra’s doctor had advised investigative surgery to find out what was causing her inability to digest food. “She refuses to do the surgery,” my niece said, her voice sounding like she was struggling to remain calm. On the highway later during most of the two hour drive, I worried about my next visit with Debra, It had never occurred to me to imagine a world in which my sister was not alive. As adults we had grown apart with brief visits during the rare trips I made back to Alabama to attend funerals, including the funeral of Debra’s son who drowned when he was barely twenty. Now I began to consider death as a real possibility. Soon my optimism about my first trip to Notasulga, in which I imagined myself an investigative journalist, evaporated into hard fatalism. This was not the state of mind I imagined myself to be in the summer before at the Norman Mailer Center where I had greedily soaked up the interview techniques that I imagined star reporters use: develop a good list of questions before hand, tape as many interviews as you can, start with the easy questions. This is going to be a fiasco, I told myself a few miles outside Montgomery. I became interested in Zora Neale Hurston after reading about other early 20th century literary figures like the poet Langston Hughes, the editor Alaine Locke and the novelist Nella Larsen. Hurston’s name appeared in articles about Harlem Renaissance writers, but I paid her name passing notice until I learned that she had been born in Alabama. I later realized that Zora Neale and I had more than that in common. We both spent time in the Washington D.C. area, both lived and wrote in Harlem, both studied at Columbia University. Until then the only writers that readily came to mind with ties to Alabama were Harper Lee and Truman Capote. Both had produced captivating works. Perhaps Zora Neale had too. Half an hour on the other side of Montgomery, I exited the highway, beginning to imagine that my quest to visit Hurston’s birthplace seemed silly. Yes, Hurston was born in Notasulga, but her family moved away when she was still a toddler. Did she even remember living in the town? Moreover, throughout her life Hurston claimed she was born in Eatonville, Florida. I understood the enticement: Eatonville touts itself as the first town in America incorporated by African Americans. Hurston’s father served several terms as mayor. 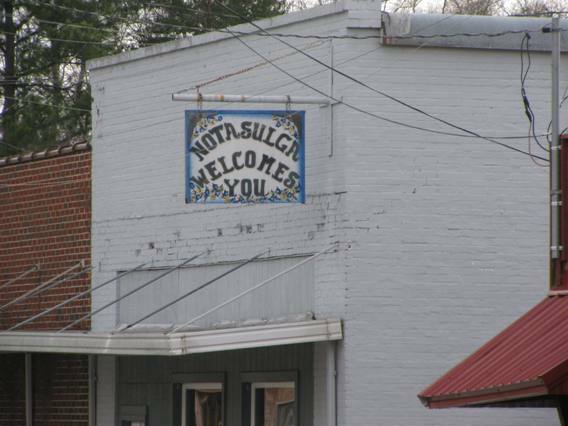 Notasulga is no Eatonville. With barely nine hundred residents within sixteen square miles, the hamlet sits a short drive from Tuskegee and Montgomery which offer museums to Tuskegee Institute founder Booker T. Washington, civil rights pioneer Rosa Parks, even Hurston’s literary contemporaries F. Scott and Zelda Fitzgerald. The important role Notasulga played in Hurston’s literary career became apparent to me after reading her first novel. Though Hurston had early success with stories set in Florida, it was the critical and commercial success of Jonah’s Gourd Vine that catapulted her from a talented but unknown writer to a commercially successful one. Many of Hurston’s important early critics and readers first came to her writing immersed in the setting of Notasulga. The Wednesday afternoon in June I arrived, downtown Notasulga — several blocks of low buildings running in several directions from a two-bulb-traffic light — had the quiet feel of a small town on a Sunday. The only enterprises that looked open were Hughes Auto Parts, Ben’s Bargains, Citizen’s Hardware and Supply and Town Hall. On the main corner, I walked through the white pillars at the entrance of Town Hall wondering if anyone inside had heard of Zora Neale. Hurston left the area over a century earlier in 1894, but she returned to the south many times. In 1927, she and fellow Harlem Renaissance writer Langston Hughes spoke to summer students at Tuskegee Institute, and in nearby Mobile, Hurston, interviewed Cudjo Lewis, the man believed to have been the lone surviving passenger of the last slave trip to land in the U.S. On other trips, Hurston collected the folktales, character sketches, and historical artifacts that informed her four novels, her autobiography, scores of plays, essays, and her many short stories. Before this trip to Alabama, I had a vague notion of what manner of suffering might make a person accept death. But seeing my sister in the hospital bed, surrounded by overturned pill cups and hanging feeding tubes and buzzing wall devices — witnessing the frail remains of what had once been a vibrant healthy-looking body — though I still did not want her to refuse the operation, I began to understand how her suffering might have opened her up to such fatalistic thoughts. Which county? I wondered outside as I stood on a small bridge at the edge of the business district looking east toward the county line. Most of Notasulga sits in Macon County but a small north-east corner lies in Lee County. Hurston’s father was born in Lee County in 1861, the year Alabama seceded from the Union. Zora Neale used to say that the area had an abundance of creeks, but below the small bridge were only railroad tracks, a reminder of the post-Civil War period when Notasulga was a whistle stop on the rail line than ran from Montgomery then east toward Opelika and the Georgia border. Photographs from the period show a post office, express office, and cotton gin. In addition to cotton, local farmers also marketed rice, tobacco, soy beans, sweet potatoes, and peanuts. Jonah’s Gourd Vine opens with the protagonist, John “Buddy” Pearson under threat of being “bound over” to one of the Reconstruction-era plantations, to toil there under conditions little better than those offered during legally enforced slavery. Pearson is not yet twenty when his step-father announces the news. His mother, unable to reverse her husband’s decision, decides to send their son into Notasulga to seek work at a farm that she hopes has better working conditions. Much of the novel is autobiographical, and John Pearson’s yearnings — like those of Hurston’s own father– eventually lead him to Florida where he becomes an influential preacher and community leader. But first, Pearson has to face the challenges of being driven out of his home in Alabama. On the plantations and lumber camps where he finds work, he has strained relationships with the first of many jealous men and inviting women he encounters often over the course of the novel. He also courts a local girl named Lucy Potts by attending Macedonia Baptist Church. The original Macedonia Baptist Church no longer exists, replaced by a stately red brick building along the highway just outside of downtown. I wandered the grounds in a fruitless attempt to find remnants of the old school house that might have been on the property. Half a mile down the road were the Spanish-style buildings on the campus of Notasulga High School, but those buildings were constructed by WPA workers in the 1930s for white students. Farther south, the Rosenwald School, financed by Julius Rosenwald, the head of Sears and Roebuck, to educate black students, was not built until the early 1900s. The schoolhouse that inspired the early scenes in Jonah’s Gourd Vine was probably one of the first schools built in the south to educate recently freed African American children. In the midst of fear and panic I reverted to the one tactic I remembered from my seminar: “What is your earliest memory of Notasulga?” I said quite tentatively. That seemed to do the trick. Mary, who I had been told might be a distant relative of Zora, said she had been born in Notasulga ninety-one years earlier when there was a single grocery store that sold shoes and hats and eggs and ground corn in the back. She recalled a clothing store, and a woman who sold Nehi sodas out of her house. She described the cotton farmers and the bankers and the two-room school in the church yard. I was still scribbling furiously nearly an hour later when the salon’s manager walked over and informed Mary it was time for her appointment. The place I had been told was the Potts homestead presented a more modest face the day I visited. A patchy yard surrounded the yellow clapboard house, which was trimmed in brown. I walked to the back yard later, unable to separate the real Lucy Potts presented in Hurston’s autobiography from the Lucy Potts in Jonah’s Gourd Vine. Both Lucys got dressed on their wedding days unsure if any family members would accompany them from the house to the church. Both Lucys later suffered a challenging marriage. And both Lucys died relatively young. So John sat heavily in his seat and thought about that other time nearly thirty years before when he had sat handcuffed in Cy Perkin’s office in Alabama. No fiery little Lucy here, thrusting her frailty between him and trouble. No sun of love to rise upon a gray world of hate and indifference. I left the Potts homestead deciding to make more visits to Notasulga, and to learn more about the town that Hurston had mined to fashion an enduring love story. The road from the Potts homestead winds past nice houses next to dilapidated ones, reminders of the economic disparities that threatened that long ago courtship and marriage that was not without its challenges. Jeffrey Colvin grew up in Alabama and now lives in New York City. He received an MFA from Columbia University, and an excerpt of his novel in progress appeared in Narrative magazine where he is an assistant editor and book reviewer. grt website,i enjoyed it evrey bit, sicne the autrhor is my nephew,mr. jegffey Colvin!!! This read was very clean, well focused and written with a sense of clarity. I found it to be rather exhilarating in its simplicity.